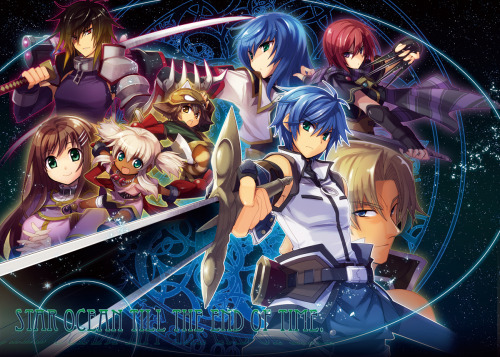 As for Role Playing Games (RPG) Star Ocean 3 or Star Ocean Till the End of Time was the first real RPG I played. I know this franchise isn’t as big as Final Fantasy for example and at the time when this game came out I wasn’t a fan of the taking turns attacking battle system. For I was more of a live type of gamer. So I clinged to this franchise before looking into other RPGs. Wait was it this game or Kingdom Hearts?…oh well Star Ocean 3 was one of the first RPGs I played then. I didn’t know what to expect when I played this game. Never heard of it, didn’t even bother to look more into this game before I bought and I was trying to buy a game I wouldn’t beat within the next few days. You know how that is. You beat a game and once you beat it you’re like now what? And so from a friend’s recommendation I bought the game and the strategy guide since I got a discount on the game if I got the strategy guide. And boy did I end up using it more than I thought I would. But I really liked this game though. I really enjoyed the storyline. I mean plot twists galore and of course occasional sarcastics jokes. Now something I thought was pretty interesting was the game mentioned how certain planets could not go to “under developed” planets. And the theory is based on messing up other planets’ rate of evolution. Long story short you would easily dominate a planet if you’re the one bringing a gun to a sword fight. And I would say Star Ocean 4 expands on this more. And just fyi Star Ocean is a prequel to Star Ocean 3. I’m not to sure about the timeline between Star Ocean 2 and Star Ocean Till The End of Time. But the jist of the story you play as Fayt Leingod (Leingod sounds pretty epic for a last name) an Earthling and you’re with a girl named Sophia who practically has you in the friend zone but treats you more like a boyfriend at times. And next thing you know you find yourself as a refugee trying to find your parents and Sophia only to find out things aren’t what you thought they were. And your whole world that you’ve perceived comes crashing down. That you’re now dealing with an even bigger threat. And I’ll stop there so I won’t spoil the game to much. Gameplay wise this game gives you quite a bit of freedom from tactics to attack patterns etc. Of course I would naturally recommend having a healer somewhere in your party. You’re gonna need it. I think that kinda goes for any game made my square enix since they tend to make bosses with seemingly infiinte about of health. I admit though it took a while for me to fully adjust to the battle system but thank goodness they have a battle simulation before you even start the game. But the story seemed very probably of how our world might be 50 to maybe a 100 years from now. I’m sure some of you out there are looking forward to the day we can travel to other planets. Until then we have Star Ocean 3 to give us an imagination. Graphics wise the game was pretty good. And of course since this is a square enix game te cutscenes were absolutely epic!!!! Rest of my favorites are at the end of this game review. I wouldn’t mind posting a video walkthrough of this game so I’ll put that on my things to do list. And since I said that the replay value of Star Ocean 3 is very high. Especially if you’re trying to get all the trophies which I say is a lot. And to be frank I don’t even know how we even get some of those trophies. You just get them somehow. If you aren’t much of a RPG gamer and are still curious Star Ocean 3 is a good way to start in my opinion since I think Star Ocean 3 is an underrated game. For I feel Star Ocean 3 still tops Star Ocean 4 but I’ll give my opinion on that game in the future.